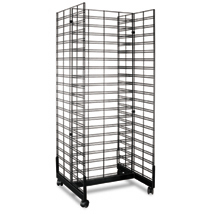 Assembles easily with three 24"W x 60"H panels, connectors and base with 3 casters. Accommodate both slatwall and grid shelves, hooks and accessories. Create your own versatile displays. Great for increasing impulse sales on candy, snacks, software, books, CDs and more. Units feature double wire construction.